Bobby and Trisha chose a beautiful morning for their intimate wedding ceremony. 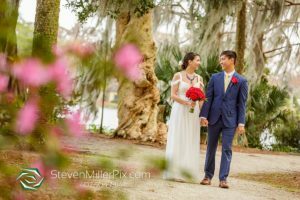 Surrounded by family and friends the couple chose to be married at Kraft Azalea Garden in Winter Park. Working with Victoria from Intimate Weddings of Orlando, they picked their location, color of their bouquet and boutonniere, and even their photographer. Flowers by Lesley crafted a beautiful bouquet and boutonniere of red roses for Trisha and Bobby. The couple asked for Steven Miller Photography to capture their wedding day. From the moment they arrived at the venue until the last guest left, Steven made sure to get everyone in front of his lens. Rev.Glynn Ferguson of Sensational Ceremonies worked with the couple to create a custom ceremony. He gave them a homework assignment to write and tell him why they love each other. Trisha wrote: I love Bobby for so many reasons. He makes me laugh every day, and he goes out of his way to do things to make me smile. More importantly, he’s never asked me to sacrifice anything for him. Two weeks after we met, we found out that I’d be moving to New York for two years for school, and he never asked me to stay. Even when being in a long distance relationship was difficult, he never asked me to drop out or come back. He’s supported my dreams and decisions since the day we met, and made a lot of sacrifices to be with me. He makes me smile every single day, and reassures me that no matter how hard things get, we will always find a way to make it work. But I think the main reason I love him is that he loves me for who I am, and always has. He’s the most incredible person I’ve ever known, and I feel so lucky and special knowing he wants to spend the rest of his life with me. I wouldn’t want to go through life with anyone else. Bobby wrote: I don’t think there’s any better way to describe Trisha than to simply say that she’s my Home. Whenever I’m with her, I know I’m safe and that I can be myself. When I’m with her, I’m always happy and feel at peace. When we’re apart, I miss her and get excited about the next time I’ll see her. We’ve unfortunately spent a lot of time apart since we met: about a week after we started dating, we found out that she got an acceptance letter from Columbia University in New York to get her Master’s Degree in Public Health. Our relationship was given a test very early on, and we were faced with a decision – we could cut our losses and not get too involved, or just see where things took us. And even though we had only been on three dates, we decided that we liked each other too much to not at least give it a shot. From then on, we tried to spend every moment we could with each other to make the time count. Since our work schedules were variable, it wasn’t always conducive to spending time with one another. But when we did, it was amazing. We were always laughing, and having fun – she took me to Disney for the first time since I was a kid (she worked there at the time), and it made everything feel like a fairytale. She’s my princess! Even now, she’s like a real version of Belle from Beauty and the Beast – she can sing, loves to read, is very loving and sweet, but also fiercely independent and strong. But after 6 months, she left for New York. I always visited as much as I could – almost every month or two. We did that on and off for about 2 years, and she recently moved back to Orlando this May. She even gave up potential job offers in New York and Atlanta (where the CDC is) just to come back and move in with me. She’s given me the world. And despite all of the ups and downs we’ve had in our relationship – no matter how far away she was or how long we were apart – we would always hop right back into it like we never even left. I think it’s because once you find someone or something that connects with you, you always carry a piece of that thing with you. And even if you get lost sometimes, you can always find your way back Home. Congratulations Trisha and Bobby we wish you happiness for a lifetime.